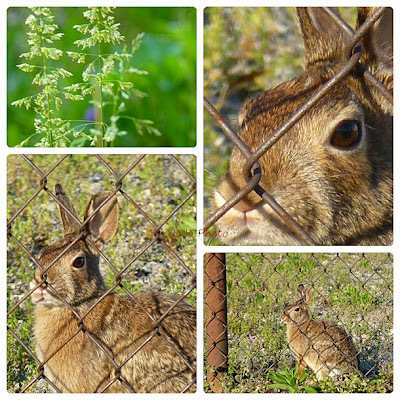 On the way back from soccer practice one evening, JoJo spotted this wild bunny in an RV park behind the fence. Being a bunny lover, he grabbed my camera and snapped some pictures. He loves bunnies and has one, Delilah, as his pet. 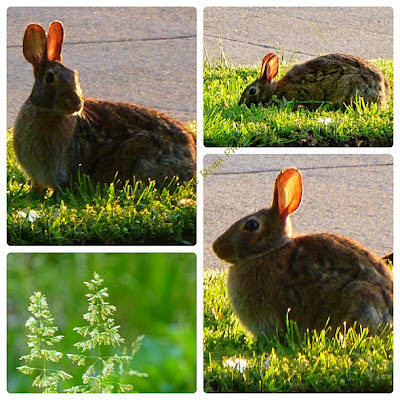 The next morning, I spotted this wild bunny in my front yard. With the sun behind its back, the ears glow! I love it.. It looked like a huge bunny when it's all stretched out, but small when it's all curved up. Wild bunny and Delilah look nothing alike! beautiful set of pictures and the collage made the picture even stand out. you and Jojo takes very good captures, wish I am like Jojo who would be encouraged to shoot through the fence as well, I usually let that moment pass, but now on seeing Jojo's pictures, I know what I have missed! Beautiful. I've hardly seen any bunnies this year. (Now we fear we will see a lot -- all in Rick's garden!). These are fabulous photos! Love the way those ears light up! Very nice. I love bunnies! Thank you Jojo for taking great pictures at a moment's notice! JoJo got some really great shots of the bunny. I love the close up. Your capture of the sunlight through the bunny ears is amazing Icy. I haven't seen any wild bunnies around here so far this year. Cute photos! I haven't seen any wild rabbits this spring. Nice! How funny, I saw three cottontails this moring too! Great shots from you and Jo Jo!! Amazing isn't it how many wild critters still manage to survive as civilization encroaches!! these are simply brilliant shots! love those adorable bunnies. thanks , your post did make me smile! Lucky you to have them so close. I also love bunnies, wild and as pet. We have a few outdoor cats, so we don't get to see many bunnies around. This one is very cute! I love wild bunnies and I'm hoping to see a few when we go camping in a couple of weeks. Wonderful captures! So sweet! I love that you made the images into a mosaic. So sweet! You and JoJo took some really great images of the bunnies.